2018 has been an exceptional year for hip-hop music and whether it receives the acknowledgement it deserves or slips below the radar in the end of year round-ups, The Mouse Outfit can be sure that they have produced one of its outstanding albums. Jagged Tooth Crook dropped on 4th May, following a string of visuals for album cuts including I Wonder ft. IAMDDB & Fox. Immediately, the musicality and variety on display outlined it as one of the year’s most accomplished production projects, but it was the contributions of MCs and musicians from Manchester and further afield, that made it the complete effort. Consistent across its seventeen tracks is a high production and engineering value, thanks to the diligence of Metrodome, Chini and Defty, the latter of whom are core members that have been with the outfit from the beginning. From its crisp, dynamic drum programming to its nuanced arrangements, allowing space for expansive jazz-infused ideas – it’s a record which sounds sweet over any system, but has the elusive second quality of being deep enough to relax with, to delve into the production and lyrical content behind the rhythms and hooks. In what is such a vital time for Manchester music, the record will go down as one that captures great contributions some of the city’s most exciting creatives. Breakout artists like IAMDDB and Berry Blacc rub shoulders with experienced MCs like Fox and Dr Syntax, while some of Manchester’s great young instrumentalists like Sam Vickery (aka. Hunrosa) and keys player Liviu Gheorghe bring their unique touch to tracks throughout the record. 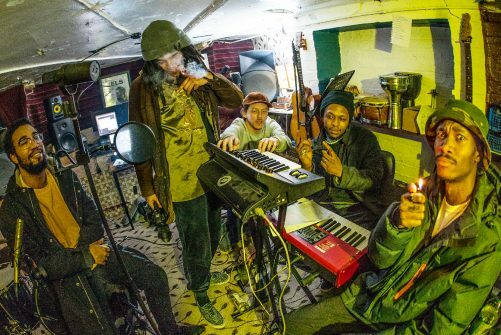 And there are no stock bars on the project: Berry Blacc puts the world to rights with the listener on Late Night Doors, while Dubbul O and T-Man spit candid bars about Money and its potential for harm on Money. 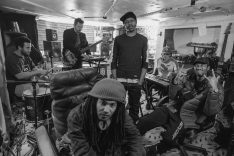 Described by EARMILK as ‘[the] UK’s premier live hip-hop band,’ The Mouse Outfit have translated what’s great about their live sets to record and vice versa. MCs Dubbul O, Ellis Meade, Berry Blacc and Kinkai join the well-drilled live band for the Christmas special at Band on the Wall on 18th December, while talented young turntablist El Statiko sets the tone with what will be a mightily impressive display of juggling and creative turntable use. Trumpeter Aaron Wood is a special feature of the live band for the show and following some recent sessions, may pop up on a Mouse Outfit studio record in the not too distant future. You can’t afford to miss hearing this new material live, alongside bangers from The Mouse Outfit’s debut and sophomore releases. Secure tickets here before the chances passes you by.